Some years ago I created a Dragon Money Clip for a fan of the Movie Face-off. While he loved the clip in the movie, we could not create an “Exact copy” due to copyright reasons. After a little time, I developed a larger version of the clip to grasp bill a little deeper into the fold of cash. This inspired a variety of Skull Money clips and even larger versions of the Dragon Money Clips. Last Spring a gentleman in England asked about a Crocodile Money Clip with the same spring action as the other working jaw pieces I have made int the past. John Aka Mrtlookalike, an American living in the UK who wanted a bit of America on him at all times. He loved the look of the Crocodile and desired a piece which could be an heirloom, something to be passed down through the generations. In his instructions, he wanted it to look as real as possible – the skin texture and eyes with his family’s name written under the jaw. The result of a lot of carving turned out to be over 10 ounces of sterling and after searching for the right kind stones for the eyes and extremely detailed piece. While I suggested a holster due to the weight, he has insisted it fits comfortably in his pocket. 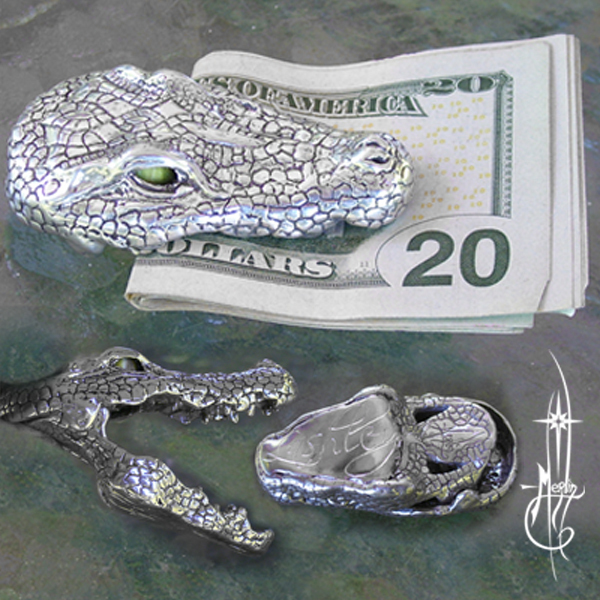 The Crocodile Money clip is a one-of-a-kind piece, no mold was taken for reproduction. The stones set from the interior of the piece to give a life-like eyes. His family name is hand engraved in the only smooth portion of the sculpture. Solid, sturdy piece should hold up through decades of wear. This piece is now residing in John’s private collection (probably in his pocket!). An American Crocodile in England holding currency in his toothy grin. If you would like something like this, you need only ask.